Hungry? Go to Postmates. Need a ride? Hail an Uber. Bored on a rainy day? Grab a book off of Amazon Prime. The world is now at our fingertips, and we can get whatever we want, precisely where we are, fast and with a great user experience. Why don’t we provide this same type of our experience for our alumni? No, we don’t have to send them something in two hours or less, but why is it so hard to register for events, find alumni in a specific area, or search for opportunities and ways you can help your alma mater. The word I hear a lot is “clunky,” and that’s most certainly where you don’t want to be in this day and time when it comes to technology. Are we trapped in our own ecosystem? “Mobile first” isn’t a new strategy, in fact, Cornell’s Andrew Gossen has been preaching it's value for the better part of this decade . But why are we so slow to embrace the concept when it comes to engaging our alumni? Part of it is that we’re trapped in our own work. When you sit down at work at your college, you’re ingesting and monitoring social media, registration pages, etc. at your desktop. You become used to the web experience and start to forget about how our constituents are experiencing our content. The fact is that in the United States over 70% of the populations digital minutes are spent using a mobile device. Think about how you check Facebook, Instagram, and Twitter when you’re home versus when you’re at work. At work, you’re probably in Tweetdeck or HootSuite, but when you’re home (and you’re not working), you’re scrolling through the particular apps on your phone to see what’s going on in the world. I’m a suburban dad, and it took me a week alone, in a big city, to have this epiphany that while we’re working hard on programming and initiatives, we’ve left user experience behind. A lot of colleges are in small towns, and you may not have Insta-Cart or Amazon Prime Now, but the majority of your alumni who live in big cities do and they expect a positive digital experience now. We are now in a world where we feel the need to be on every platform in hopes to connect with every audience across Facebook, LinkedIn, Twitter, Instagram, Snapchat, and whatever else becomes popular in the hands of our constituents. So how do you grab back the attention of your alumni or at least compete with everyone else? The answer is to start thinking digital first and provide a positive user experience. Remember that when you’re about to hit send or open up registration for a new event that almost three-fourths of the people who come into contact with that email or webpage are going to do so on a mobile device and not their computer. Are you looking for a place for your alumni network to live? Then it needs to be in the hands of your constituents with a mobile app. 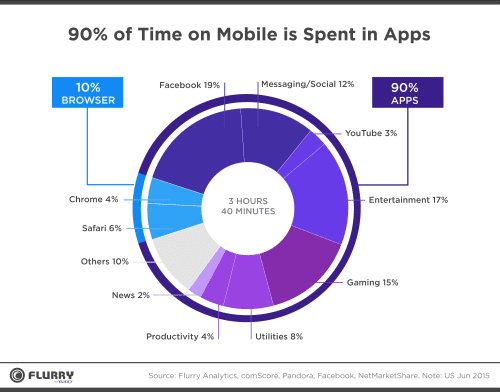 The vast majority of someone’s personal internet experience is on their mobile device and over 90% of that usage is in mobile applications. How nice would it be to get off of a plane in Atlanta, see who you know from college in that area or even attend a local chapter happy hour why you’re in a different area. What if your alumni could easily compete with each other in the name of school pride and you could easily see who your color bleeders are and the best ways to activate them? The technology is here! We just need to meet it with a warm embrace and create the most positive experience possible for the people who love their alma mater. Not only does an app give you a tremendous user experience, but it also allows to track the engagement of your alumni base and to turn that into actionable intelligence for your events and initiatives. Facebook and LinkedIn are a great place to promote your events, but you lose that unique intelligence that an app will bring. If you’re thinking of spending a lot of money and resources in a web experience and network for your alumni, think again. Are you ready to connect your network and empower your alumni? The Tassl App will bring you a customized experience to easily access the resources, connections, events, groups, and news wherever you go.